Anyone else been there? Archeology Magazine ranked the discovery of 14,000 year-old coprolites at Paisley Caves, Oregon, as the 4th most significant archeological discovery of 2006. Coprolites are petrified human feces. The samples were carbon dated by Cambridge University using a new method with an error of plus/minus 500 years. That threw something of a wrench into the academic status quo, which believed for almost a century that Clovis culture was the earliest to migrate into North America some 10,000-12,000 years ago. This is a fascinating archeological area of Oregon. Just a few miles up from Paisley Caves is another cave complex where the oldest clothing ever found was discovered by the University of Oregon archeology department back in the 1930's: a 10,000 year-old cache of sandals intricately woven from sagebrush (40-50 pairs). 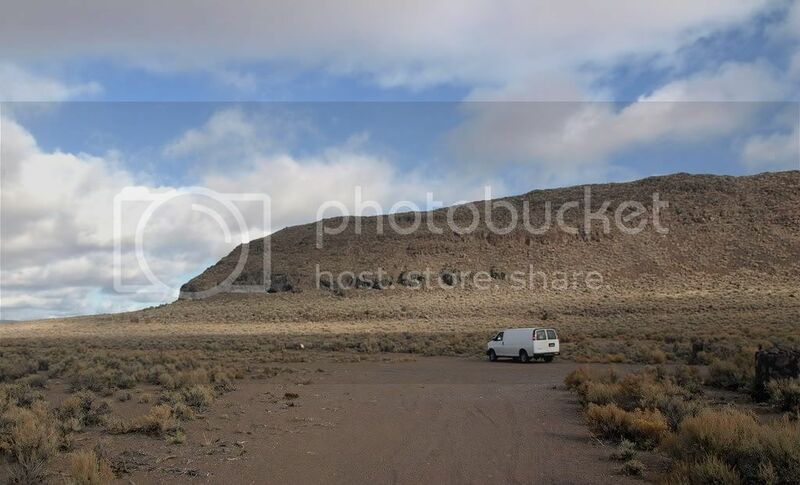 The photo shows my van parked in front of the Paisley Caves complex. The cave furthest to the left is where the coprolites were discovered. There was a large lake here at one time. The caves (there are four) were used as temporary shelters by hunting parties preying on large animals coming to the lake to drink. The Paisley Caves complex is only excavated for a few weeks each summer by University of Oregon archeologists, so discoveries of even older human habitation are entirely possible with future digs. Last edited by pogomutt; October 17th, 2012 at 12:39 AM. When was the colonoscopy discovered? Moving this to archeology--it's a clean fit for our newest subforum. Here's a link to the press release that someone posted in this forum 5 years ago. I may have been off a year on the Archeology Magazine piece. I think it was 2007 rather than 2006. The press release also states that the coprolites date to 14,400 years ago, even further back than I stated. And then of course there's Kennewick Man. Well, I guess that link isn't going to work. Just type "Paisley" in the forum's seach box. The press release should come up under "Today's articles"...I hope.